RUBIO: THE LEAST ELIGIBLE OF THEM ALL - A LIAR SUPPORTED BY THE OLD REPUBLICANS! WHY ISN'T THE COUNTRY ASKING WHY FLORIDA IS NOT SUPPORTING THIS "WET BEHIND THE EARS" MANIPULATOR? Mark Levin: Will GOP Contenders Follow Rubio’s Lead and Endorse a Convention of States to Amend Constitution? Florida Sen. Marco Rubio called for a convention of the states to amend the Constitution to push for term limits, a balanced budget and other measures. (People the Constitution already calls for a balanced budget EVERY YEAR. IT IS THE OTHER MEASURES YOU SHOULD BE VERY AFRAID OF BECAUSE THEY DON'T HAVE TO TELL THE AMERICAN PEOPLE FIRST? “One of the first things I will do when I am in office is … put the weight of the presidency behind of a constitutional convention of the states so we can pass term limits on members of Congress and the Supreme Court, and so we can pass a balanced budget amendment,” the Republican presidential candidate told an audience in Clinton, Iowa, Tuesday. The announcement was well received by the Convention of States Project, which put out a video after the announcement. As said before the Constitution already calls for a balanced budget every year and they had failed to do that since before the Clinton years, passing a budget in 2015. So since they passed a budget why are they not living up to it? What is the need for the Omnibus bill - because they are spending willy, nilly and the Constitution means nothing to any of them. Term limits - the elected men and women of this government will NEVER agree to that - the money is too good for the job they have and are are not doing it very well. Terms limits for the Supreme Court I agree with but it doesn't take a Con V to do that. Take A Closer Look At The Candidates! The press is not going to tell you the real truth about these candidates because the right questions are not being asked. In the case of Rubio, you need to speak to the people in Florida who helped get him elected and how he has ignored their best interests and those of the country ever since he was elected. His time in the Florida House is wrought with problems from his leadership especially showing lack of judgement and inexperience. The very fact he is Jeb Bush taught should throw up warning signals. The following piece is one that was recently written by a FORMER Rubio supporter who is extremely disappointed in him as are others including myself. But truth is truth! A Man's Character Tells a Great Deal! In July 2002, Marco Rubio sent a letter recommending his brother-in-law for a real estate license in Florida and his brother had served time in prison for cocaine trafficking. At the time, Rubio was the majority whip of the state House of Representatives. Now, the Republican U.S. senator is running for president in 2016. The recommendation letter was written on Rubio’s official stationery and addressed to the Florida Division of Real Estate. In it, the candidate doesn’t state his relationship to Orlando Cicilia, who is married to Rubio’s sister Barbara. Cicilia had served 11 1/2 years in federal prison for a cocaine trafficking conviction and was released one year and eight months prior to Rubio’s July 2002 letter, according to the Post. He was convicted in 1989 for distributing $15 million of cocaine. 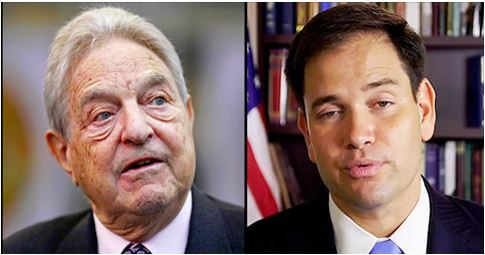 Who is Marco Rubio Really???? In a May 13th address to the Council on Foreign Relations, Rubio described TPP as the “second pillar” of his "three-pillar" foreign policy and declared: “It is more important than ever that Congress give the president Barack Obama trade promotion authority so that he can finalize the Trans-Pacific Partnership. Does Rubio feel this was because he believes he will be the next president and he will be able to make decisions of which the Constitution does not give to him or anyone else? for foreign worker visas - and Rubio's on the wrong side - again! RUBIO - the MILLION $$ BOY! • Millions of people are living paycheck to paycheck at the same time they're working as hard as they ever have because everything costs more. They have not had a real raise in decades. Yet, Senator Rubio you fully support the H1B Visa of which has and will put millions of Americans out of jobs. In addition, you and others have done nothing to stop Obama's "out of control" spending. NO ONE - Absolutely no one should be surprised by this! As bad as things are under Ryan, McConnell and Obama, they could be made worse, or at a minimum equally bad, under an open borders President such as Rubio working in tandem on the same DC “K” street corner with his fellow political street walker, Rep Paul Ryan. Rubio’s not only been a strong advocate for amnesty, being beholden to many of the same people who have a standing rental agreement on Paul Ryan, but he’s obediently authored legislation to increase the levels of the abuse-prone H1-B visas. They’re, not surprisingly, a favorite of both those seeking to displace American workers with low-cost foreign replacements and Senator Rubio. Rubio will try to tell you “People buy into my agenda. I don’t buy into theirs.” I don't find this statement holds water as we all know when these big money guys hand out all this cash they expect something in return - favors, legislation, etc. Keep in mind those who use the "humanity" reason for open borders are as a rule also supporters of a New World Order and that calls for Open Borders as written in the text of the North American Union of which Heidi Cruz played a major role. MILLION $$ DADDY'S BRINGING HOME THE GREEN! ​Million-dollar donors are featured prominently in the super PAC supporting Florida Sen. Marco Rubio’s presidential bid. Miami-based automobile dealer Norman Braman gave $5 million; Besilu Stables LLC, owned by Miami health care executive Benjamin Leon, gave $2.5 million. In total, the group Conservative Solutions pulled in about $16 million, including a $3 million gift from Oracle founder Larry Ellison. ELIGIBLE FOR PRESIDENT OR NOT? But a review of documents — including naturalization papers and other official records — reveals that the Florida Republican’s account embellishes the facts. The documents show that Rubio’s parents came to the United States and were admitted for permanent residence more than two-and-a-half years before Castro’s forces overthrew the Cuban government and took power on New Years Day 1959. The real story of his parents’ migration appears to be a more conventional immigrant narrative, a couple who came to the United States seeking a better life. Rubio’s office confirmed that his parents arrived in the United States in 1956 (actual date 5/27/56)but noted that “while they were prepared to live here permanently, they always held out the hope and the option of returning to Cuba if things improved.” They returned to Cuba several times after Castro came to power to “assess the situation with the hope of eventually moving back,” the office said in a statement. There is a difference America to his father being a RESIDENT of Florida and a NATURALIZED AMERICAN. Rubio seems to have a natural ability to embellish each and every story he tells. RUBIO IS NOT ELIGIBLE TO BE THE PRESIDENT OF THE UNITED STATES! This 555 document was put together by a Democrat group - hence has taken a great deal of flack. However, as a conservative and long time watcher of Rubio, I have yet to find any errors. I am in the process of going through it again and picking out certain subjects to address. They will be added to this page as I complete them. Rubio as with his mentor Jeb Bush are certainly Not who they like to portray themselves as. Rubio voted "yea" on the TPA giving Obama free rein to do as he pleases. 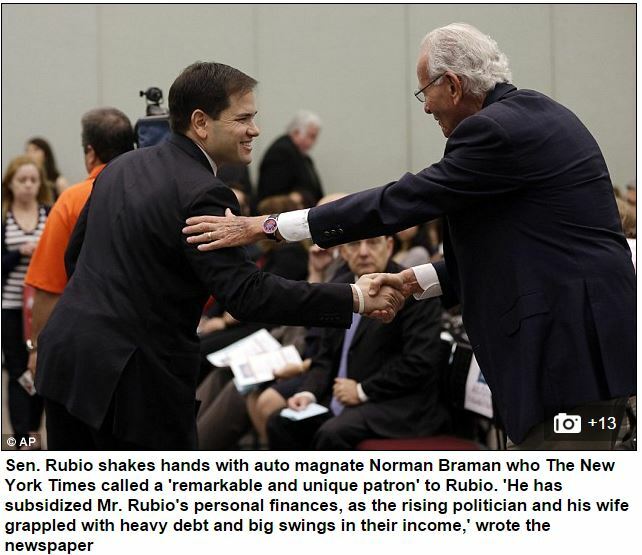 According to Breitbart, After the Wall Street Journal listed Rubio as supporting the pact, a new paragraph suddenly appeared at the end of the piece stating that 'Mr. Rubio’s spokesman said that although he backed the bill granting Mr. Obama fast-track trade authority this summer, he has not decided whether to support TPP legislation.'" Rubio most recently said he has "very positive" feelings about the trade deal, but he did not say whether he would vote in favor of the deal. After the last presidential debate (11/10/2015) in the spin room, Breitbart News explicitly asked Sen. Rubio’s campaign if Rubio was “prepared to reverse his endorsement of TPP.” “No,” Rubio’s campaign manager Terry Sullivan said in response. “I mean, look, I can’t speak for Marco — only Marco can — but no, his position is solid on that standpoint,” Sullivan said. In that April 29th op-ed in the Wall Street Journal, Rubio wrote: “We must rebuild our own military capabilities, conclude and pass TPP, and renew our support for freedom and the rule of law in Asia.” In a May 13th address to the Council on Foreign Relations, Rubio described TPP as the “second pillar” of his three-pillar foreign policy and declared: “It is more important than ever that Congress give the president Barack Obama trade promotion authority so that he can finalize the Trans-Pacific Partnership. (That is the job of Congress not the President by the Constitution). Now the Constitution has no place in the decisions and workings of our government. On June 24, 2015, by a vote of 60-38, the Senate approved trade promotion authority (TPA) as part of HR 2146 - Defending Public Safety Employees' Retirement Act. Rubio was one of two Republicans who did not vote on the bill. On May 22, 2015, the Senate passed HR 1314, which was used as a legislative vehicle for trade legislation with the titles "Trade Act of 2015" and the "Bipartisan Congressional Trade Priorities and Accountability Act of 2015," by a vote of 62-37. The bill proposed giving the president trade promotion authority (TPA). The bill also included a statement of trade priorities and provisions for trade adjustment assistance. Rubio voted with 47 other Republicansenators to approve the bill. In an April 29, 2015, op-ed in The Wall Street Journal, Rubio argued that the United States and Japan should form a strong alliance and work with Japanese Prime Minister Shinzo Abe to finalize the Trans-Pacific Partnership (TPP) trade deal. He wrote, "The Trans-Pacific Partnership (TPP), discussed between President Obama and Prime Minister Abe this week, will further our strategic goals in Asia and increase prosperity at home. It will advance economic liberty and unleash free-market forces in the world’s most dynamic region. It will create the opportunity for emerging economies to become the next 'tigers' of Asia and enhance linkages between nations in the Western Hemisphere and East Asia. ...Concluding TPP will require the passage of Trade Promotion Authority by the Congress. Our foreign trading partners like Japan need to have confidence that American presidents can deliver on free trade. Once we pass Trade Promotion Authority we can finish negotiating a pact that will help build a network of Pacific economies based on competition, the rule of law and free markets." SOMEONE PLEASE ASK THIS "WET BEHIND THE EARS" SENATOR HOW THE TPP IS GOING TO GIVE AMERICA MORE JOBS. HE IS LISTENING TO THE CORPORATE MONKEYS WHO HAVE A FINANCIAL INTEREST IN THIS AS RUBIO DOES WITH THEM. THE TPP WILL SEND JOBS OUT OF AMERICA RUBIO - READ THE BILL! Rubio Attained Personal Wealth With Political Committees And Usage Of A Republican Party Of Florida Credit Card As His Power Rose, $600,000 Was Stored In Two Political Committees Known As Floridians For Conservative Leadership And Floridians For Conservative Leadership. Some in political circles say this is dead weight and an old issue, but it does go to show character and lack of good fiscal oversight. After Rubio Was Selected As Speaker-Designate of the FL House, Jeb Bush Offered Him To Hire People In The Executive Branch Who Would Eventually Work For Rubio and he proceeded to hire 18 of Jeb Bushes former staff. In The End Rubio Voted For Protecting The Right To Keep And Bear Arms In Vehicles. On April 18, 2008, Rubio voted for the Preservation & Protection of the Right to Keep & Bear Arms in Motor Vehicles Act. Rubio Voted in Favor of Expanding Tax Credit Voucher Program. On May 2, 2008, Rubio voted in favor of a bill to expand Corporate Income Tax Credit Scholarship Program by increasing the maximum tax credit from $88 million to $118 million. Rubio Voted for Changing the School Voucher System. On October 29, 2007, Rubio voted for a bill that would change the corporate income tax credit scholarship program by increasing the award limit for middle and high school students. The program provides an income tax credit for corporations that make eligible contributions to nonprofit scholarship-funding organizations (SFOs). Rubio Voted to Protect Charter School Sponsors from Civil Litigation. On May 4, 2006, Rubio voted for a bill that provides that a district school board sponsor of a charter school will not be held liable for civil damages for actions or omissions committed by the charter school’s governing board, its officers, or employees. This bill also provides that the sponsor’s duty to monitor a charter school may not be used as the basis for a lawsuit against the sponsor. EXCLUSIVE: How Marco Rubio charged thousands in personal expenses on his Republican Party credit card including $4,000 flooring for his Miami home. Rubio only repaid the state party once he was found out. ALIPAC is issuing the following comment to the national media regarding this important development. "Marco Rubio's admission on Univision that he supports Obama's despotic illegal invader amnesty orders will prove to be a political death blow to his campaign if candidates like Trump and Cruz deliver this news to GOP voters nationwide. Rubio's prior alignment with Obama and Democrats to pass the immigration reform amnesty bill S. 744 in the Senate in 2013 combined with these latest remarks prove that Rubio is like Obama on immigration issues 100%! Rubio being caught in bed politically with Obama on immigration issues will send his meager support levels much lower. ALIPAC firmly opposes Marco Rubio, his amnesty legislation, and his efforts to continue Obama's unconstitutional amnesty orders that other Republicans like John Boehner and Paul Ryan are protecting and facilitating." Two days ago - MARCO RUBIO TO JORGE RAMOS: I WILL KEEP OBAMA’S FIRST EXECUTIVE AMNESTY IN PLACE UNTIL LEGISLATIVE AMNESTY ENACTED - In a little-noticed interview earlier this year with Univision’s Jorge Ramos, Sen. Marco Rubio (R-FL) declared that, as President, he would keep Barack Obama’s executive amnesty for DREAMers in place until it was permanently codified through legislation. When Rubio was running for the Senate in 2010, this household supported Rubio until he openly lied to us. Not an important subject in the scheme of things, but we both felt if he would lie about something so small, what would he do after he got in Washington. Well, he got into Washington and has lied since then. Sen. Rubio’s past is under fresh scrutiny as he emerges as a top presidential prospect. During last week’s debate, he deflected questions about his financial discipline — most recently, he liquidated a retirement account — but those questions will only intensify. “For years, I’ve been hearing that his credit cards are a disaster,” Donald Trump said Tuesday during a news conference in New York City. The Tampa Bay Times asked Rubio’s team for the records in June and again in early October. UPDATE: Marco Rubio's blatant lie about his personal finances should worry you! Moderator: Senator Rubio, you yourself have said that you’ve had issues. You have a lack of bookkeeping skills. You accidentally inter-mingled campaign money with your personal money. You faced foreclosure on a second home (co-owned by scandal riddled David Riveria) that you bought. And just last year, you liquidated a $68,000 retirement fund. That’s something that cost you thousands of dollars in taxes and penalties. In terms of all of that, it raises the question whether you have the maturity and wisdom to lead this $17 trillion economy. What do you say? “Marco just flat-out lied to the American people, there,” he continued. “And I was stunned that the moderators didn’t stop there and go, ‘Wait a second, these are court records. What are you talking about?" After years of supporting his mentor Jeb Bush, it seems Rubio is going to try and march to his own tune. However while he has been in the Senate he has still supported Bush agenda's including education and immigration. In 2013, Senator Marco Rubio (R-FL) introduced an "Educational Opportunities Act" which would have created a voucher-like system allowing children from low- or middle-income families to attend private schools funded through tax-deductible corporate and private donations. The businesses get the write-off and taxpayers lose out on public revenue. Rubio has a record of supporting Bush's voucher scheme. Bush, after having tried for years to get the voucher system approved in Florida it was knocked down by the Florida Supreme court in 2006. Livid that he seemed to have lost the battle, Bush contrived Plan B. Rubio played a role in that game yoo! These guys could not operate as clean and legal if their lives depended on it. It seems big money is what will move Rubio along. I remember his lying to my husband and myself during his race for the Senate - a small lie and low on to totem pole in the scheme of things. We both decided if he would lie on something that small, what would he do in D.C. He has been mentored by Jeb Bush since he first got involved in politic's. He recently got a big funding gain in the form of hedge-fund billionaire Paul Singer’s decision to throw his financial weight behind Sen. Rubio. This recent action has sparked fresh questions about Rubio’s coziness with the financial interests funding his career. Singer “quietly got involved in the fight for immigration reform, making a six-figure donation to the National Immigration Forum”— a George Soros-backed organization that lobbied for Rubio’s legislation to issue 33 million green cards to foreign nationals in the span of a single decade. Perhaps one of the most widely-criticized areas of Rubio’s campaign pledge to create “A New American Economy” on migrant labor is his support for tripling the controversial H1B visa program. Rubio has co-authored two pieces of legislaton that would massively expand the wage-depressing H1B visa program used to replace American workers in white-collar jobs. His most recent bill—known as I-Squared—would triple the number of H1B visas imported into the United States despite the fact that the U.S. Census Bureau reports 3 in 4 Americans trained in Science, Technology, Engineering, and Math (STEM) are not employed in those fields. The Walt Disney Company used H1B's to lay off hundreds of American workers and forced them to train their low-wage foreign H1B replacements. Disney’s CEO has endorsed Rubio’s I-Squared bill. Larry Ellison, the founder and executive chairman of the Oracle Corporation, has been another one of Rubio’s financial boosters. In July, 2015 the WSJ reported that Ellison gave $3 million to the pro-Rubio super PAC. In June, 2015 Ellison hosted a $2,700 per-person fundraiser for Rubio. Oracle is the 20th biggest users of H1B and has endorsed Rubio’s Gang of Eight and I-Squared immigration bills. H1B expansion critics allege that Rubio’s donors have benefited in other ways from his immigration legislation. For instance, according to open-secrets, Carnival Corporation is one of the top 20 contributors to Rubio’s campaign committee since 2011, having donated $14,500. Enrique Gonzalez – High-powered Miami immigration attorney who joined Rubio’s Senate staff in 2013 to help craft the failed “Gang of Eight” immigration proposal. Rubio and Gonzalez, who has returned to private practice, have been friends since they served together on the West Miami City Commission in the late 1990s. He's a climate denier. Or an environmentalist. ​Or...As speaker of the Florida Legislature, Rubio shepherded a landmark bill to limit greenhouse gas emissions, voiced caution about drilling off the Sunshine State's coast, and argued that climate change was real. "Global warming, dependence on foreign sources of fuel, and capitalism have come together to create opportunities for us that were unimaginable just a few short years ago," he told his House colleagues in 2007. Of drilling, he said it should only be done if it could be proven environmentally safe, and it wasn't a silver bullet: "Even if we started drilling tomorrow morning, it could take close to 10 years before we start seeing the benefits." But as soon as he jumped into the US Senate race, his love for Mother Earth faded. He stumped for a Palinesque pro-oil campaign called "Drill Here, Drill Now." He ridiculed cap-and-trade emissions plans as "European-style" or "California-style" social engineering. And he attacked his Senate opponent, the moderate Republican-turned-independent Charlie Crist, as "a believer in man-made global warming." "I don't think there's the scientific evidence to justify it," he told the Tampa Tribune. 2010 Race - Rubio lied to Tea Party members in the 2010 senate race saying that he would never support amnesty. He even said Reagan made a mistake signing the amnesty bill , because it only caused a wave of new illegal immigration. Karl Rove, who is at war for the heart and soul of the Republican Party said "Crossroads is second to none in our support of Tea Party candidates, we spent $2.9 million for Marco Rubio, more than any other group." Let’s be clear here, Rove isn’t’ interested in backing Tea Party candidates, he’s out to destroy the Tea Party. Many Tea Party people in Florida were upset with Rubio as to his actions during the race never saying "thank you" for all the hard work done for him. Tea Party members across the country should remember who Rubio considers stakeholders in this illegal immigration issue. It’s not the taxpayers, ​Rubio won’t mind pushing the 2.6 trillion dollar price tag of amnesty on taxpayers any more than he minded sticking the 3.8 billion illegal immigration cost to Floridians when he was Speaker. Rubio just another one of these guys who rolls with the wind!